A committee of MPs at Westminster has been hearing from local residents affected by aircraft noise linked to George Best Belfast City Airport. Belfast City Airport Watch representatives before their meeting with the Northern Ireland Affairs Select Committee at Westminster. From L to R: Barney Gadd from Stranmillis, Dr Liz Fawcett from Ballynafeigh, and Jenny Simon from Sydenham. The umbrella residents group, Belfast City Airport Watch (BCAW), was invited to give evidence to the Northern Ireland Affairs Committee at Westminster on Wednesday, 24th October, as part of its inquiry into an air transport strategy for Northern Ireland. All three MPs whose constituencies are affected by the noise issue – Naomi Long MP, Alasdair McDonnell MP and Lady Sylvia Hermon MP – sit on the Committee and were present at the meeting. 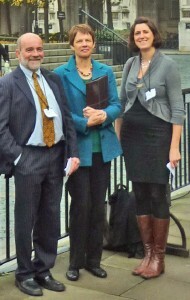 Dr Liz Fawcett, Chair of the BCAW Steering Group, said the group was very pleased with the reception it got from the MPs. “The Committee members were really attentive and clearly interested in the issues we raised,” she said. “We stressed the need for robust regulation of aircraft noise. The UK government is in the process of producing a strategy designed to tackle this issue, but its current proposals don’t go far enough. In addition to Dr Fawcett, who lives in Ballynafeigh, the Committee also heard from Sydenham resident Jenny Simon, Barney Gadd of the Old Stranmillis Residents’ Association, and Joe McGlade of the Park Road and District Residents’ Association.